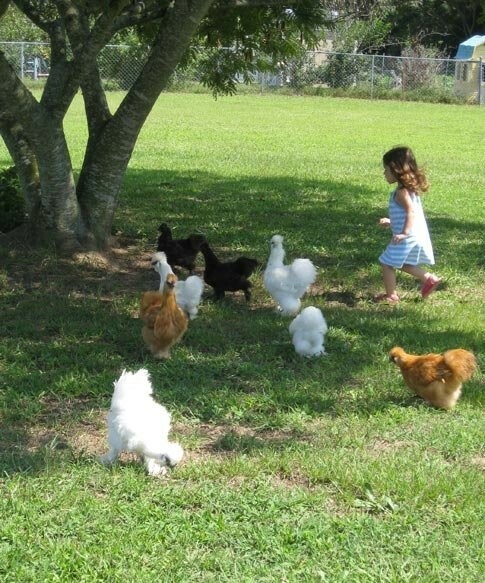 Our blog at My Pet Chicken has made many posts and references about the social misconceptions associated with keeping a backyard flock. Such as Lissa’s post: Do chickens make you look poor? Yet, the humble chicken always finds its way back into our backyards and hearts. When I read this essay by E.B. White—“The Hen: An Appreciation,” from the book of essays, The Second Tree from the Corner, 1944—I was shocked by how we, as humans, repeat our own absurd social notions, even across centuries. Our Silkies wander free by the Mimosa tree. This brings to mind our economic issues of the recent years, 2008 and beyond—and how we went on with our everyday lives before then, grocery shopping, and buying our eggs in cartons, as if these little pearls of protein originated nowhere before they appeared in the grocery store and came home to our fridge. Then we saw turmoil in our lives, upsetting our wallets and our days of ignorance came to an end. The concept of victory gardening came into our lives again. Along with a garden, most of the families I’ve known have added a few hens to work hand in hand with their tomatoes and herbs. It has become a time, again, that where you live doesn’t matter because we made room again for our feathered friends in our lives among our picket fences. I can’t tell you how many statutes in city and country alike have ousted the chicken from backyards! Sometimes rules automatically regard them as livestock, as if they could not be as important to a family as their household cat, or family dog. People are fighting to change the laws, city by city and town by town, as neighbors step up speaking in favor having hens. But in the meantime, many are still keeping hens in secret in fear someone will call the police and haul off their sweet Betsy and Henrietta. I’ve personally seen the social stigma in a modern society. Of course, with the Internet and Facebook, we live in a time where people will nose into your lives and openly pass uninformed judgement. But when we moved outside city limits, I found a whole new world open up to me. No more apartment meant land. …And the joy animals gave me. I was able to fill our home with lots of love for furry and feathered beings. So chickens moved right in, before we even finished unpacking our city life. I couldn’t wait to share my new found love of having chickens, and no sooner did I share online, did comments like “You’ve gone country!” started popping. I just “Keep Calm and Chicken On!” so to speak. Now, many years later, I have more friends posting about their adventures with chickens then ever before, and they haven’t even left the city behind. Some post with thanks for bringing them into the fold, other to inform me of their newest breed obsession. But city or country, these chickens are now EVERYWHERE! I certainly hope if you find any more historical references to this wonderful bird you feel free to share with us, they’re an important part of history. Everyone should know the chicken as we at My Pet Chicken Do! 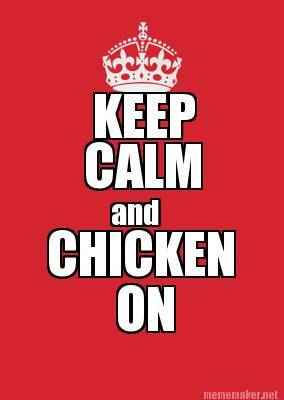 I’m stealing the ‘Keep Calm and Chicken On’ picture…That’s so me. I always wanted the country life as a child and people thought I was crazy. Now I’m living the dream and can’t imagine life without my chickens, ducks, geese, goats, and sheep. Last year had a woman ask me why I was starting my hobby farm so late in life. Wasn’t I too old for it? Told her that you’re never too old to follow a dream. And I can’t wait to see where my dream takes me as our flocks and herds grow. Love the picture 😉 and that in a country that is becoming more and more strict by laws created by ignorance people are still able to live on the land! Those are cute critters/pets you have! !